than a Box of Cherry Bombs." BoneStamp: The rubber stamp to give the finger. It's no joke, you really can buy one here! Bonestamp Special (2 Standard BoneStamps) $16.99 with FREE SHIPPING! 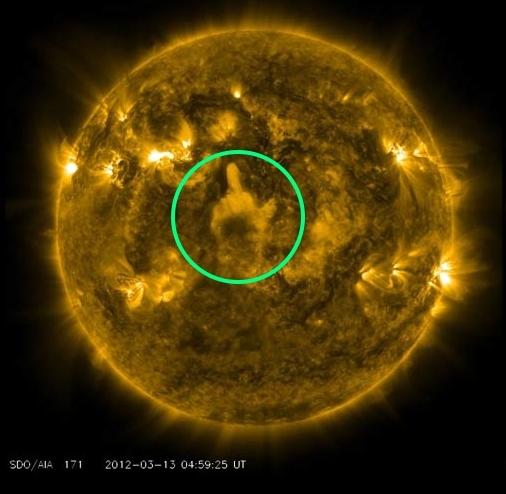 The Sun Gives the Finger! Suppose you are the Sun and in a big snit. First, you send out a solar storm to ruin radio transmissions and spread cancer throughout your solar system. Yet, not all planets have radio and the cancer may take 30 years before people start dying in agony. So what do you do? You flip the bird, naturally. It only took seven minutes for that wagging finger to be seen on Earth. You wouldn't believe how many hydrogen bombs it took to give that finger! If the Sun needs a Bonestamp from time to time to feel more powerful, why shouldn't you? Besides, when you use a Bonestamp, no one will die of cancer. Flipping the Bird or Giving the Finger? Thank God for BoneStamp? and our product line of flip the bird and/or give the finger hardware and software. Help your friends and relatives to to give the bird in absentia by giving the gift of BoneStamp. The only choice you have to make is whether to rubber stamp the finger (with a rubber BoneStamp?) to suggest "shove that baby where the sun don't shine" or to use your email to send the international symbol for "up yours" (with Virtual BoneStamp?)." Don't you wish all your choices in life were that pleasurable? While we hope it is less inflammatory to mail an imprint of the finger using a rubber BoneStamp? (or by email with Virtual BoneStamp?) than to wiggle your own middle finger under the nose of the person you disrespect, we are not absolutely certain. Let's face it, flipping the bird in person or by proxy is always a dangerous, potentially life-threatening (your life, that is) act. Mercy, you don't want to be chased down and shot, knifed or beaten to death do you? Of course not. On the other hand, you don't want the person that you loathe to have a nice day, either. What to do? We don't know but we suggest that if you employ a BoneStamp that you do it carefully since not everybody is reasonable or has a sense of humor. Something New in Anger Management! Get a look at this darling little boy before the social workers takes him from his parents. He is a two fisted little tyke who can hardly wait to flip off the world. 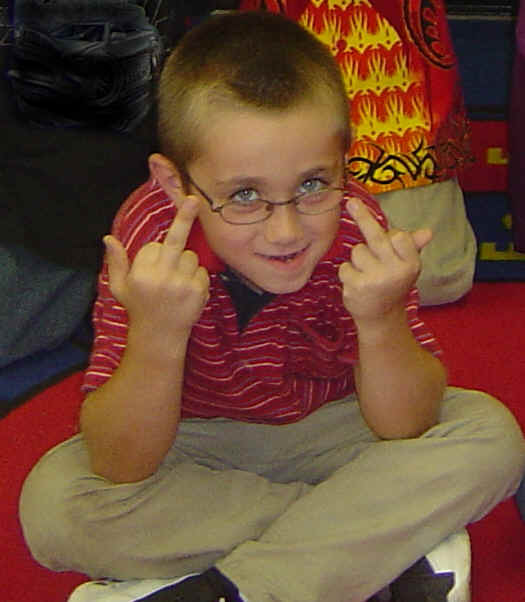 He instinctively knows the power of giving the finger. He can hardly wait to grow up to be 18 years old so he can buy a BoneStamp of his own. Grown up little boys and girls with loaded fingers (just like him) are why www.BoneStamp.com exists. Hard experience teaches us that it is a much better idea to passive aggressively flip the bird with a rubber stamp or via e-mail than to do it right to someone's face. Remember, you may not need a BoneStamp product often but when you need it, you really need it. Flipping the Bird ("giving the finger"), The First Amendment, and Cowboy Rights have triumphed in Court. Indeed, an enlightened Texas appeals court has found that one motorist flipping off another is an act in the best Texan tradition of being base, common, rude, vulgar, tasteless, and legal. Presumably the same Texas jurists would view the BoneStamp® product line as charitably as they view a raised middle finger behind a slow vehicle: a birthright worthy of Constitutional protection. However, the BoneStamp Corporate Legal Department has asked us to remind visitors that even if flipping someone off is legal, it doesn't make it less dangerous to your health, especially in Texas. As "Remember the Alamo" suggests, the Texans have a long history of putting displays of bravado above survival. Since 1998, we are the sole creators, manufacturers, and purveyors of the rubber stamp that gives the finger and the original graphics software flip-off application for Windows9x/NT/2K/XP/VISTA/Windows7 (32 or 64). Whenever you want to symbolically stick up your middle finger, whether on your letterhead, corporate network or Internet, we are the folks who help you get your finger off your hand. While you are here buying finger flipping goodies for your self, friends and family, you will want to check out Bone Gallery, the world's largest assemblage of flip-off fine art. Before you go, don't miss either the BoneMischief or BoneCelebs to see for yourself how giving the finger can affect your reputation for the better or worse.